While Christmas in Japan is a very different experience to those that we enjoy in the west, there’s a familiar tradition that arrives every New Year’s Eve in the shape of Kohaku Uta Gassen. This has become the show that most families will gather around to watch together at the end of the year and features a broad spectrum of musical acts. Kohaku Uta Gassen is an annual event that’s produced by public broadcaster NHK, which has its roots in radio broadcasts from the 1950s, before making the jump to TV. The show divides its broad range of artists and bands into two distinct teams, roughly divided into male and female – Red and White – through which viewers are invited to vote for. A recent Japan Times feature on Kohaku Uta Gassen (which explored the possible political machinations of old school outfit Southern All Stars on last December’s show) invited debate surrounding the long-running TV show. Kohaku tends to come under fire over questions about its relevance in 21st Century Japan, much in the same way a lot of people like to mock Jools Holland’s Hootenanny show (which could be considered the rough UK equivalent to Kohaku). The Japan Times article notes: “Even the choice of artists was geared toward maintaining the show’s fading reputation as the country’s indispensable arbiter of pop taste, something it hasn’t been for at least two decades”. “Pop taste” is, as always, a subjective thing, but at the same time it’s a bit much to pass off many of the artists appearing on the show when you’re dealing with J-Pop heavyweights such as Perfume, Kyary Pamyu Pamyu and Momoiro Clover Z. Kohaku has become a showcase for many idol outfits, including AKB48 and various Johnny’s outfits, including Arashi and SMAP, but it’s clearly got an eye on popularity and relevance, which, for many, is irrelevant in itself as J-Pop is the regular Aunt Sally for various pundits to throw coconuts at. Kohaku aims at a broad demographic, reaching out to everyone from Enka enthusiasts to anime fans – the 65th show featured performances from Dream5 and King Creamsoda performing popular anime opening themes (including the Youkai Watch theme from the insanely popular anime). For the 2013 show they tapped into the popularity of the Attack On Titan anime by having opening theme band Linked Horizon perform in the studio. The J-Pop culture site Tokyo Girls Update recently posted up an interesting article on the development of idol outfits (which is worth reading itself), but also noted in passing that Kohaku had steered around other popular groups of the moment, such as BABYMETAL and Dempagumi.inc. But the article noted the inclusion of Dream5 being almost certainly influenced by the “social phenomenon” of Youkai Watch. 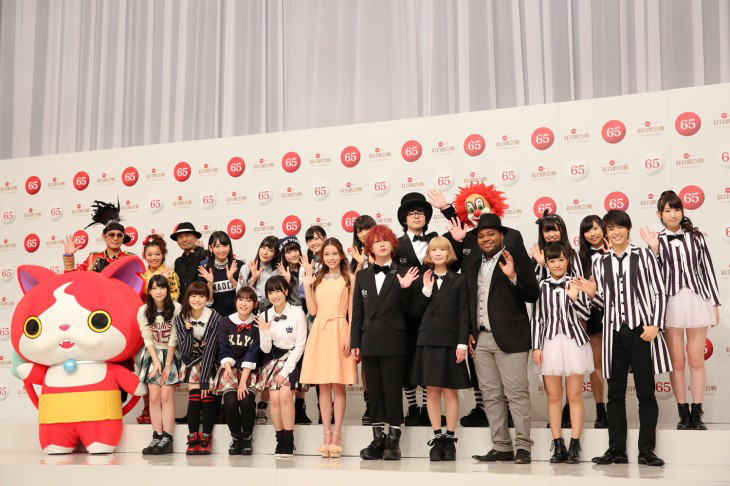 In other words, the show appears to be more concerned with backing artists that have connections with brands that have a lot of reach – or that are popular and established brands in themselves, such as Kyary Pamyu Pamyu (despite some corners of the blogosphere that earnestly want to believe that KPP’s time has passed). But Kohaku is not without its own controversies. In 2006 DJ OZMA performed his hit song ‘Age Age Every Knight’, during which his female dance team whipped off their outfits to appear naked (actually wearing flesh-coloured body suits – a tactic that anti-idol outfit BiS had employed in more recent times). There was also scrutiny about the lack of K-Pop acts appearing on the show, which some critics suggested had a connection with the continuing political dispute between Korea and Japan over islands in the Sea of Japan. It’s not strictly an issue of Kohaku’s musical content that attracts scrutiny however. As NHK is a public broadcaster funded by a licence fee, it’s subject to the criticism from some quarters of the media, much in the same way that UK papers like the Daily Mail criticise the BBC. Or as the Japan Times article states: “NHK can afford to do what it wants because of the public’s mandatory financial support, even though the public — despite management lip service to the contrary — has no direct say in the network’s decisions”. There’s probably more of a case in viewing our own Jools Holland extravaganza as a tired and increasingly irrelevant TV show, which in recent years has taken on a reputation of being endured rather than enjoyed (unless you’re a big Emeli Sandé fan!). While Kohaku might plough the well-trodden path of traditional light entertainment, for a J-Pop fan you’re getting the opportunity of seeing performances from several of the most popular acts in Japan at the moment – in turn, these acts are getting a boost to their own profile. Plus, you’re spared the horrors of Jools Holland lending his honky tonk piano to the strains of ‘Kira Kira Killer’!